Elizabeth Ride: Now, here’s a mystery. After reading the latest BAAG article, Bosco Radio Corp, the Gardner brothers and Kyoei Corp, I followed the link to the Shirogane Maru, and found that it differs in one important point – the fate of the ship. Wrecksites has it remaining in Buin for the duration of the war, while BAAG has it entering Kowloon Docks for repairs and refitting in 1944. Could this be the same Maru? Kwong Chi Man: Regarding the Shirogane Maru. I found a Japanese document (in 1939) about the small Shirogane Maru (a steamer running between HK, Macau, and Canton before the war and continued during the Japanese occupation). The large Shorgane Maru (3,000t) that was abandoned in the South Pacific in 1942 was another ship. HF: Here’s what the ship looked like according to the BAAG agent’s observations in 1944. And here’s what it looked like pre-war, according to www.combinedfleet.com founded by Jonathan Parshall. This website contains extensive information about the Imperial Japanese Navy during WW2. But note the different spelling. ER: This BAAG report has it entering Kowloon Docks for repairs and refitting in 1944. HF:The website wrecksite however says, “On September 15th 1942 US submarine USS Amberjack torpedoes… Shirogane Maru at the northern entrance of the Bougainville Straits… Destroyers Amagiri and Hatsuyuki rescue the survivors. To prevent her sinking [the ship] is towed and grounded at Buin. Efforts to float her are in vain and [it] remains in situ during the war. The combinedfleet article on the ship written in 2012 by Gilbert Casse, Bob Hackett and Peter Cundall has this to say on the Shirogane Maru. I have abridged what they wrote to the laying down of the ship and its launch. And the events leading up its demise in October 1942 when grounded near Buin town on Bougainvillea island. 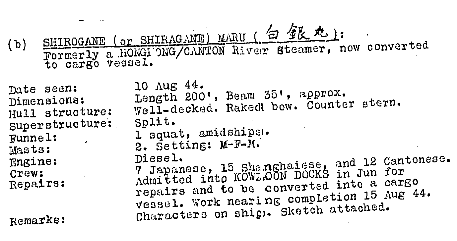 It also appears to confirm that Shirogane Maru ended her days in the south Pacific in 1942. Aioi. Laid down by Harima Steel K.K. shipyard for Nippon Kaiun K.K. as a 3,130-tons cargo ship. Departs Truk for Bougainville Island, Solomons. About 11nm E of Luluai Point, Bougainville. LtCdr John A. Bole’s (USNA ‘28) USS AMBERJACK (SS-219) sights a transport. At 1005, Bole attacks and hits SHIROGANE MARU’s starboard side in the boiler and engine room, at 06-33S, 156-05E. Three men are KIA. The impact causes a hole of about 2.8ft radius. Water rushes in and floods the engine room by 7ft. The ship goes dead in the water. Later in the day, destroyers AMAGIRI and HATSUYUKI depart Shortlands to assist the damaged transport. SHIROGANE MARU is towed to Shortlands where unloading is processed. To prevent her sinking, SHIROGANE MARU is grounded at Buin. Efforts are being made to lighten the ship. Materials of the 16th Naval Construction Unit are, as much as possible, unloaded. However, towing still proves impossible to make and therefore, no further work is undertaken. Remains of the dead are to be transferred to Sasebo under telegram No. 281430. Ship remains in situ but is still retained in the Navy’s list. HF: There is slight variation in spelling within these sources Shiragame, Shirogane, Shiragane… how many ships are we talking about? Stephen Davies: On the Shirogane Maru, having read the post, it seems to me clear from the drawing and data, and cross-correlating them with the pic., that the vessel that entered the docks was NOT the large vessel but the smaller. 1. that there are not just two but FOUR variant spellings in the Romanized name. 2. Lloyd’s Register opts for ‘Sirogane Maru’ in most cases but has ONE (http://www.plimsollshipdata.org/pdffile.php?name=30b1081.pdf) ’Shirokane Maru’ – a very small wooden, twin screw diesel vessel launched in 1912 and still listed in 1940. 4. TWO of them are the two Elizabeth is discussing. I think it follows that the vessel described in the intelligence report at only 200’ long and needing conversion is the second, smaller Sirogane Maru, is the ship that Dr Kwong Chi Man describes, and is not the larger one. This solves Elizabeth’’s problem I think. This article was first posted on 12th September 2014. The website has several articles about British Army Aid Group (BAAG) reports from HK during WW2 and about various aspects of life in HK during the Japanese occupation. The index shows all of these. Hugh – is there a possibility that the Kowloon Docks’ records from 1944 still exist? If so, they might be able to throw more light on this. For the record, my past research coincides with the explanations by the esteemed Stephen Davies. Built by Mitsubishi Zosen, Kobe for Setsuyo Shosen K.K., Osaka as SHIROGANE MARU for Osaka/Sumoto route. 1938 name re-spelt SIROGANE MARU. 11/39 t/f to Osaka Shosen K.K. for charter to Kanton Naiga Unei Kumiai 広東内河運営組合 (Kwantung Inland Waterways Operations Cooperative). for operation in Pearl River Delta. 28/8/45 sunk by mine in Pearl River. A few photos are known to exist of this ship. I am sending by email a very clear broadside view of SHIROGANE MARU running trials in 1938 and also a link to a photo of the ship at Central in 1940 taken by the New York Times reporter Harrison Forman. The BAAG sketch indeed shows no sheer and a relatively short funnel, and some of the suprstructure has been cut away, and masts fitted. To my mind there is little doubt that the observer was looking at the small 1938 SHIROGANE MARU.